With the power outage last Saturday, we hied off the kids to Makati. Along the expressway, we saw a major cause of the power interruption - stupid billboards going down crashing on houses, buildings and power lines! We took the opportunity to take back water since we brought along carbuoys, jugs and a plastic drum. We filled 'em all up with water 'cept the drum that we filled up to one-third. So we left the kids there at Makati. Sunday, we inspected the apartment for damages. Luckily, there were no major damages. Even Unit D with the aircon hole left open wasn't as bad as we expected. And there was no flooding in the immediate area either. DH did a lot of trimming and me, I jotted down notes and sawed off the pesky tree intruding into unit A. We finished almost at 11am and then passed by LaCo which was devastated by floodwaters courtesy of Milenyo. We proceeded to have lunch at Ho Chai Lai - my treat for DH. DH had patatim and I had beef curry which were both good! The chicken curry I had there a long time ago wasn't so good. Plus we had some seafood noodles and dumplings this time. We even saw and talked to Jimmy Ventura on the way out who were dining there right after their Sunday service at Jesus Our Shepherd Church across Ho Chai Lai. I had Extra Super Batchoy and she had Super Misua (doncha love these names?). And we both had yummy puto. 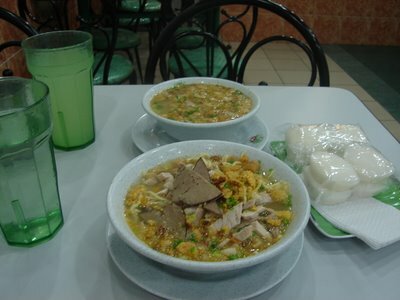 The great thing about Ted's Oldtime Batchoy is that you can always ask for free soup. Hmmmm... so yummy!